Similarly to Service Links, ServiceTrade quotes are designed to engage your customer online, with sharp-looking quotes that they can approve with a single click. From any deficiency page, click "Create Quote" or "Add to Quote". From any location page, click "Create Quote". Can I create a quote directly from a job? See the beginning of this article for the two current ways to create a quote. How do I name or rename a quote? Click 'Manage Quote' in the upper right part of the screen. This will give you various advanced options for the quote, including the ability to rename it. How I delete a quote? Click the red "cancel" button. The canceled quote will remain on the historical record for that location. How do I show a discount on a quote? You may wish to have a library item called "Discount" (or many different ones), or simply type "Discount" as an item on your quote. Enter a negative price to signify that this is being taken off the quote. How do I assign a quote to another team member? -In ServiceTrade, you may assign quotes to other team members in order to better organize the life-cycle of a quote. Create a quote, or choose an existing quote.On the quote click Manage Quote in the upper right corner of the window. On the quote click Manage Quote in the upper right corner of the window. What is the difference between removing a service from a quote and deleting the service? When you add a deficiency to a quote, you are creating a service. Delete = deletes that service. It is gone everywhere. Remove from quote = service is no longer on quote, but will still show as an open service on the location page, or as a suggested service if you click "Add Job" from the location page or scheduler. What does 'History' show me on a quote? This video goes into detail about quote history. 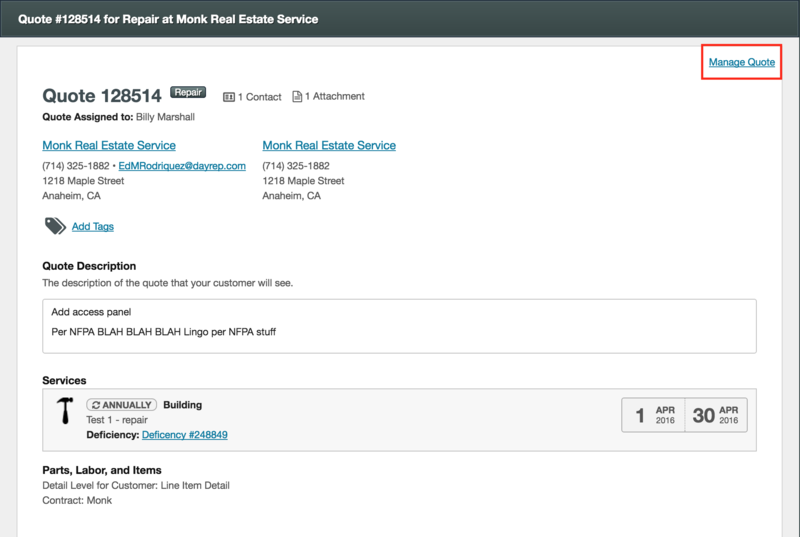 The viewer and their IP address(es) are clearly displayed any time they view, request changes to or approve the quote. My quote got approved by two different IP addresses? What does that mean? It most likely did not. If you check the history more carefully, someone probably viewed the quote on one device (such as their phone), then waited to approve it when they were back at their desk. How can I get rid of suggested deficiencies? Any deficiency with a new status and resolution on that location will continue to display in the suggested deficiencies list when adding deficiencies to a quote. To trim this list down, you should either quote deficiencies or otherwise review them asap (marking them as invalid, customer notified, etc). They will then fall off of these lists. How do I edit an approved quote? 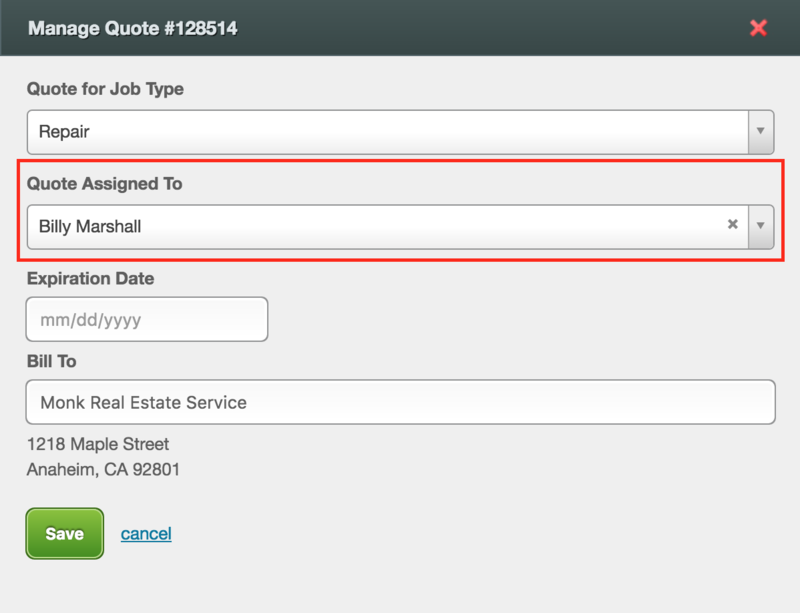 If the approved quote has not yet been added to a new or existing job, click the "re-open quote" button on the right side of the quote page. If the approved quote has been added to a new or existing job, you will need to disassociate it from the job first. To do this, note the job link in the top right of the quote page. Right click that link, then choose "Open in a new tab". On the job page, look though the service(s) on the job. Any service(s) that came from the quote will have a link to the quote within them. To disassociate the quote from this job, you will need to click the gear on each service that came from a quote, then click "remove from job". Repeat until no services remain from the quote you are about to edit. Return to the quote and refresh/reload the page. You should notice the job link in the top right is now gone, and the "Re-open quote" button on the right side of the page is now able to be clicked. What are the different statuses of a quote and what do they mean? New: A newly created quote that has has no changes made to the quote. Draft: A quote that a user has entered any information in the Quote Description, Services, Parts, Labor or Items sections. You may also see a quote return to this status if a customer requests changes on the quote. Submitted: A quote that has been sent to the customer. Approved: A quote that has been accepted by the customer. Approved without Job: A quote that was approved by the customer but has not been associated with an existing or new job. Actionable by vendor: A quote that has not been submitted to a customer or the customer has not requested changes for. Note: we do not notify the customer of changes post-approval. You will need to either submit the quote to them for re-approval, or discuss any changes with them, then click the "approve" green button. Can I add a comment to the quote, and will the customer see it? Quote comments that are set to "everyone" will be seen by the customer, if they view the quote again. The customer does not get an email that you added a comment, however.